Apartment in Hillside, Edinburgh - Spacious and Bright Apartment, Excellent Local Area, Free parking, Close to Palace, Parliament. Well located bright and spacious two bedroom apartment sleeps six in traditional Edinburgh tenement. Great location within walking distance of Edinburgh Old Town and the city centre. Excellent local amenities and easy access to the city sights. Only 10 minutes walk from the Royal Mile, parliament and palace. Flexible accommodation sleeps up to six guests in a combination of double, twin or super king plus additional sofa bed in the lounge. There is a bright bay windowed lounge with flat screen TV/DVD, Cable TV, stereo and dining area where you can just sit and watch the world go by. The modern kitchen is well equipped with gas hob, electric oven, fridge/freezer, microwave, toaster, washing machine and all utensils - everything you need to enjoy a fully self catered stay. The bathroom as both shower and bath for your comfort. Gas central heating throughout. The apartment has free wifi and free on street parking. We provide all towels and linen for your stay. We also provide a full meet and greet service and complimentary flowers, tea, coffee, milk etc for your arrival. Good selection of DVDs and books for your enjoyment. This is a well located apartment where you can take advantage of a superb range of local shops, cafes and delicatessens just by the apartment and with a cosmopolitan selection of bars, cinemas, theatres and restaurants within the nearby Leith Walk area. There is an excellent choice of sightseeing possibilities close by - Edinburgh's historic Royal Mile leading from the Palace to the Castle is only a 10 minute walk, as is the Scottish Parliament and the beautiful open spaces of Holyrood Park. Also within walking distance is the stunning viewpoint of Calton Hill where you can get views across the city and up to the Highlands in the north. For the more adventurous there is Arthurs Seat - Edinburgh’s highest hill just a short hike from the apartment. Enjoy! The apartment you will be letting was my home for 13 years. I am Edinburgh born and bred and have lived in the city for a total of 28 years. I now live in rural Perthshire where I make a living as a tour guide, musician and therapist. I have three properties in Edinburgh that I let. I hope you enjoy the apartment and the city. This property sits in a terrific location within Edinburgh, just outwith the city centre but close enough to walk to most of the main sights. The Easter Road area has it's own identity with a great selection of local cafes. If you like the outdoors it is close to Calton Hill and Holyrood Park, is near the coast and is very accessible for the city centre. The area has a good local feel. There are great views from the property - you can sit in the bay window and just watch the world go by. 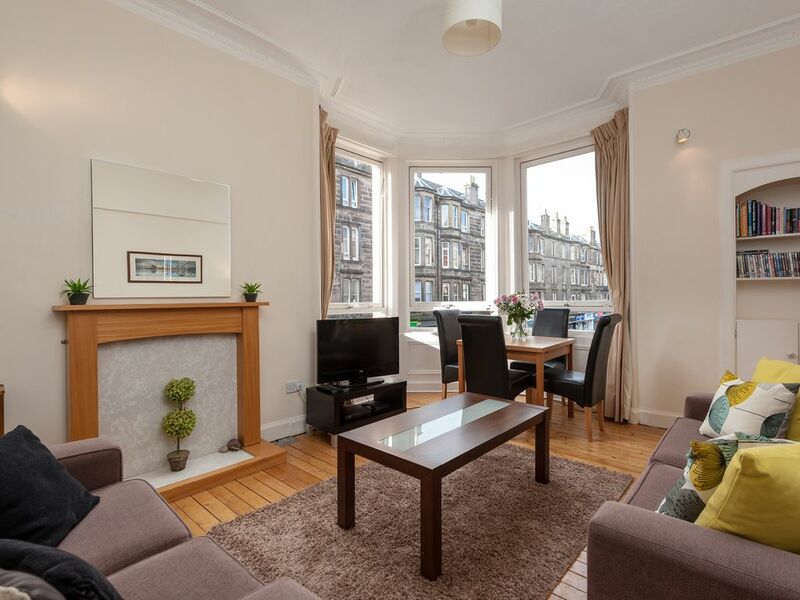 Enjoy being walking distance from the park, Calton Hill, the city centre and the heart of the Old Town. Bathroom with full size bath, electric shower, wash basin and w.c.
All linen is provided for your stay. Parking is free and available on the street immediately outside the apartment and on adjacent streets. Can be busy but usually possible to find a space. Bright and spacious lounge with bay window where you can sit and watch the world go by. A dining table seats up to 6. Lounge contains flat screen TV/DVD with freeview, stereo with Ipod dock and free wifi. Sofa bed accommodates 2 additional guests. All utensils and crockery are available. Fully equipped kitchen contains all utensils with gas hob and electric oven, microwave, fridge/freezer and washing machine. Combined TV/DVD with variety of DVDs available. Stereo with CD playe and Ipod dock available. Selection of various novels and guides provided. Only 25 minutes drive from the city Hillend dry ski slope sits at the edge of the Pentland Hills, just outside the city and accessible by city bus. Local golf courses within the city and only 10-15 minutes drive from the apartment include Prestonfield, Duddingston, Craigmillar Park, Murrayfield and Braid Hills courses. Outwith the city there are further courses along the beautiful coastline of East Lothian. Notes on accommodation: We provide a meet and greet service to introduce you to the apartment. Please make sure you let us know your arrival time in advance so we can coordinate to meet you. One of the bedrooms can be set up as either a superking size double or as two twins. Please let us know in advance which you would prefer and if you also require the use of the sofa bed in the lounge. Cot and high chair are also available - please specify when you book. The apartment benefits from free parking on the street immediately outside the apartment and on adjacent streets. Outside: There is a quiet communal shared garden to the rear of the property. Cleaning / Towels / Linen / Maid service: All linen and towels are included. For stays of more than one week, fresh linen is provided each week. Fresh flowers, tea and coffee are provided on arrival. Meet and greet service on arrival and on call property contact to ensure your stay runs smoothly. Very pleasant stay. Loved Scotland. The cable tv didn’t work very well. The apartment was clean and fresh. The meet and greet service was flawless and was useful and very friendly. Beds were surprisingly comfortable. Easy walk into Old Town and New Town Edinburgh and Leith. Plenty of small pubs in the neighborhood with good food for those drizzly nights where you don't want to wander far. The only time we used a car service was for airport transfer. Gourmet coffee and pastry shops within a few storefronts of the apartment. Very safe feeling neighborhood. We thoroughly enjoyed our stay. Not as nice as the photos....bathroom not so good (broken toilet seat, low pressure in shower). But roomy, very secure, good beds, and decent location. The apartment is located reasonably close to Waverly station and right next to a range of cafes and convenience stores. We were a family of three and the two bedroom and living room was comfortable enough for us. A Great Base for Exploring Edinburgh. We loved our stay in this flat! It is so convenient to EVERYTHING: groceries, bakeries, pubs, restaurants and transportation. The flat itself was clean and comfortable with all the amenities - even a beautiful bouquet of freshly cut roses to greet us. A stop for the "hop on/off" bus was just a short walk away and we used that to get our bearings in the city and discounts into some of the attractions. Then getting about was easy and returning to the flat each evening to relax and recharge was a joy. A great stay! We are glad you enjoyed your stay in the flat and the convenient location - there is a great range of shops and specialist food outlets on Easter Road. Also glad you appreciated the flowers! Good that you made good use of the hop on/off bus which can be a great way of seeing a lot of the sights and familiarising yourself with the city. All the best with your travel and hope to see you again in the future. Beautiful, well kept and located in between Edinburgh and Leith! Groceries near by, walking distance to Holyrood Castle and nearby hiking. Walked everywhere but there is bus line right in front of the place as well. Your host is a tour guide within Scotland and can provide you with details of excellent tours available to places outwith the city such as Roslin Chapel, Stirling Castle, Whisky Distilleries, The Highlands, Loch Ness, St Andrews and other places of interest which could all be reached in a day trip from Edinburgh. Longer multi day tours to places such as the Isle of Skye are also available from Edinburgh and your host is happy to provide further information. The apartment is ideally located for Portobello beach, only 10 minutes by car or 15 minutes by local bus. This is the city's local beach and as well as a long sandy beach there are numerous amusement arcades along the promenade. There are further excellent beaches within 30-40 minutes drive along the east coast from the city such as Yellowcraigs and Gullane. The apartment is located 15 minutes walk or 10 minutes by taxi from Waverley Train Station. From the airport, a taxi takes around 30 minutes to the apartment or the airport shuttle bus to the city centre takes 30 minutes (last stop Waverley Station). You can also take the tram from the airport to the last stop in the city centre (30 mins) and then from the same stop a bus (4,26,44) the last 5 minutes to the apartment. A car is not necessary within the city which has an excellent bus service. The palace, parliament and Royal Mile are only a 10 minute walk from the apartment. Edinburgh castle around 20-25 minutes walk (bus 10 mins). The city centre is only a 15 minute walk (10 mins bus). Royal Yacht Brittania and the shore area of Edinburgh are 15 minutes by bus from the apartment as are any of the main galleries and theatres within the city. Further affield the coastline of East Lothian is a 30 minute drive, Roslin Chapel 30 mins (or bus no 15), Stirling and Glasgow 1 hour by rail. There are a range of great little shops close by - the Manna House coffee shop and patisserie is an award winning bakery and definitely worth a visit and there are several other good coffee shops/cafes/delis. Cornelius wines is excellent and full of good advice on wine choice. There are also a good local supermarket, take away restaurants and several convenience stores and grocery shops in the immediate vicinity of the apartment. For a fantastic view of the city take a walk up Calton Hill. You can be at the top in 10 minutes from the apartment and the views are just tremendous. For a little more exertion take a walk through Holyrood Park, just 10 minutes away and up along 'The Crags' - a long cliff line with fantastic views or up to the summit of Arthurs Seat - the highest point in the city. If shopping is more of interest then George Street in the city centre is full of designer outlets and is now partly pedestrianised. For restaurants there are numerous good places at the top of Leith Walk (10 mins walk away) or if you would like to seek out a good Edinburgh pub then the Broughton Street area near the top of Leith Walk has some good traditional ale houses. For children we reccommend Our Dynamic Earth near the Scottish Parliament and 10-15 minutes walk from the apartment. This is a fascinating journey through time and the history of the earth with plenty of interactive material for children. There are numerous tours on offer within the city including open top bus tours and various 'ghost tours' in the Royal Mile area. Details of these and other activities in the city are provided within the apartment. Check In: Changeover day is flexible. Check in is from 2pm on the day of arrival. For check in between 19.00-22.00 there is a late check in fee of £20. For check in between 22.00 - midnight fee is £30. Check out is by 10am on the day of departure. Full details for check in will be sent with your booking. Check out is by 10am. Late check out may be possible subject to a fee of 50% daily rate for that day. Terms and Conditions. This property is let on the understanding that it is to be used as a holiday let. It therefore is subject to Section 12(2) and paragraph 8 of Schedule 4 of the Housing (Scotland) Act 1988. We'll send you an email confirming your booking, this then forms a contract of booking. You are not permitted to sub-let the property (or any part of the property). The number of people occupying the premises must not exceed the amount stated at time of booking. You must vacate the premises without demand on the agreed departure date (at the agreed time). You agree to pay the lessor to cover any loss or damage caused (beyond general wear and tear). At all times, the property must be kept in a clean and tidy condition. We may charge you for any unreasonable amount of cleaning required after your stay. You agree to prevent any party members from causing a nuisance or disturbance to other residents/neighbours. You agree that the hired premises will be secured when unoccupied during your stay. You agree that owners/agents will be allowed access to the property if required. We recommend obtaining personal holiday insurance to cover any potential losses. We take no responsibility for any damage or injury however caused by any member of your party whilst you stay at the property. We (including the property owners, managers and agents) accept no responsibility for loss, injury or damage to any member of your party.